Ferndown was showcased to its very best advantage during the Mayor of Ferndown’s civic day on 9 October. More than 30 mayors and dignatories from all over Dorset assembled at the town council offices at King George V Playing Field before setting off on a tour of the area. 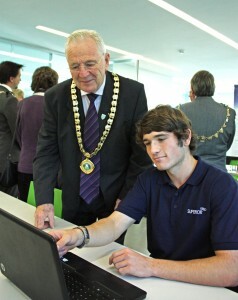 The day commenced at Superior Seals on the Ferndown Industrial Estate, now Dorset’s largest industrial estate. Superior is an internationally renowned manufacturer of precision elastomeric ‘O’ rings, seals and special mouldings. Mark Wallis, commercial director led the party around the Apprentice Academy, the material science laboratory and the manufacturing and logistics areas. Members of the party were impressed by the level of reinvestment in technology, the light and airy architectural design of the offices and manufacturing facilities, the painstaking attention to detail and the ethos of the academy, run by Jim O’Neil. Currently 18 Dorset apprentices are being trained, the most recent intake being drawn from five schools local to Ferndown. 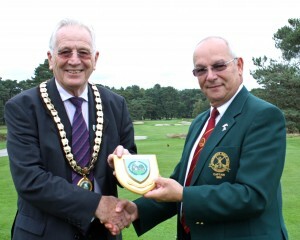 The tour moved to Stapehill where Cllr John Lewis, the Mayor of Ferndown presented a plaque to Neil Lucas, owner of Knoll Gardens in recognition of his excellent support to Ferndown Town Council, particularly in respect of technical advice over the years and the donation of grasses and seats to Ferndown’s Millenium Park. The party was captivated by the passionate presentation given by Neil while touring the four acre show gardens. A ‘champion’ eucalyptus, the largest in the UK was singled out as one of the best specimens anywhere in the British Isles. Neil’s low impact gardening ethos was summed up as ‘More wow, less work’. Next stop was Ferndown Golf Club where the mayor’s party was treated to a buffet lunch and afternoon tea. Afterwards, a plaque was presented to club captain Barry Vincent in recognition of the club’s centenary and the contribution of the club to Ferndown life. It has also retained its place in the world’s top 1,000 golf courses. 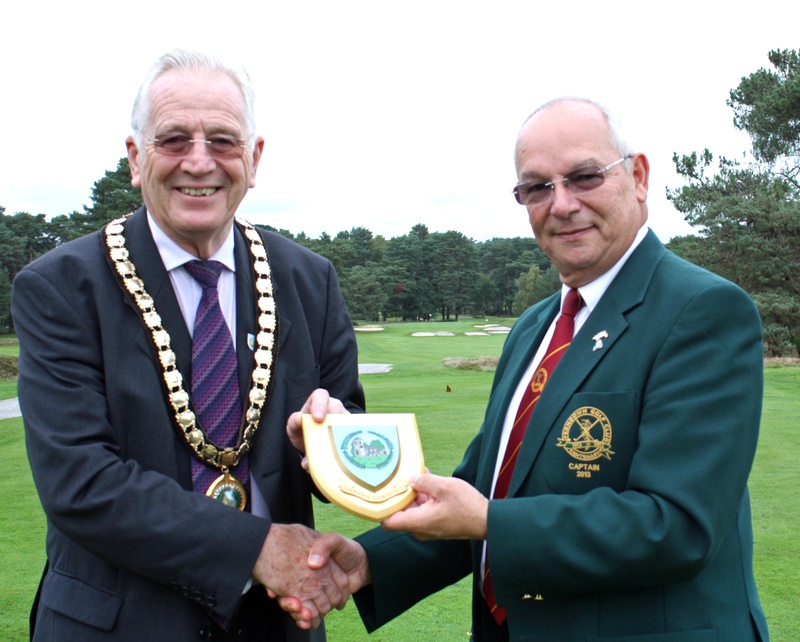 A moving presentation was given by Martin Stewart of Stewart’s Garden Centre recalling the history of the family’s business, its role in the history of Ferndown and principally its involvement in the building of Ferndown Golf Club. Martin’s father was a previous captain of the club. Barry Vincent spoke briefly of the club’s proud history, liberally sprinkled with the names of many golfing greats who have played the course including Harry Vardon, Percy Alliss, Peter Alliss, Sir Nick Faldo, Seve Ballesteros, Greg Norman and Ian Woosnam. Ferndown Golf Club also hosts the Alliss-Merlo charity golf day every September which benefits many disabled young people. A fascinating talk on the history of Ferndown was presented by Mike Fenner and the Civic Day concluded with a fun indoor putting competition which raised funds for the Mayor of Ferndown’s chosen charity, Langside School for children with special needs including cerebral palsy. Ferndown’s Mayor Cllr John Lewis was pleased with the smooth organisation of the event by the town council office and delighted by the many compliments received from his guests.